Instructions for getting EOSISH (WISH holders). Blog / Instructions for getting EOSISH (WISH holders). Today we are sharing the details of the Airdrop. At this time we will make image of Ethereum & EOS blockchains and fix how many WISH & EOS every account has. Airdrop date: EOSISH distribution will be completed in 3 weeks after the snapshot date. By the 6th-Nov-2018 all tokens will be distributed (including bounty). 1. 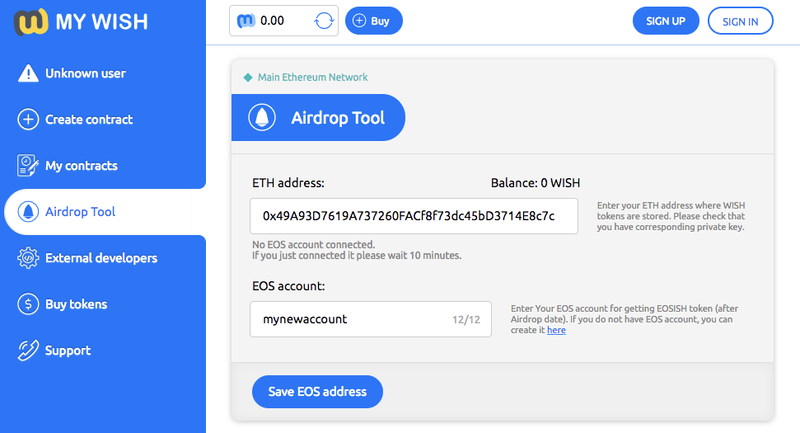 By the snapshot date you will have Ethereum account with some WISH tokens. How to create it? If you have WISH on the exchange account you have to move WISH to your own account. 2. You will have EOS account. You can create it here. No need to change Advanced settings. 3. Connect your ETH address with EOS account here. You will have about 0.0004 ETH on the account to make the transaction. 4. After making the connection you can check that it was connected here. Wait for 10 minutes after the connection before checking. 5. Wait for the snapshot time and the distribution. You will get as many EOSISH as you have WISH at the snapshot moment. We will create the video instruction soon. Stay tuned!